We'd had a bizarre evening I can tell you! For some crazy reason I'd convinced Cinabar to book tickets at the local theatre to see Priscilla Queen of the Desert. Neither of us had seen the film, but I figured it might be a cross between The Rocky Horror Picture Show and The Little Shop of Horrors. And it was kind of. It was certainly funny, bizarre, and dazzlingly entertaining. We weren't to be disappointed! After a spicy night on the tiles I just had to have a spicy late night snack. 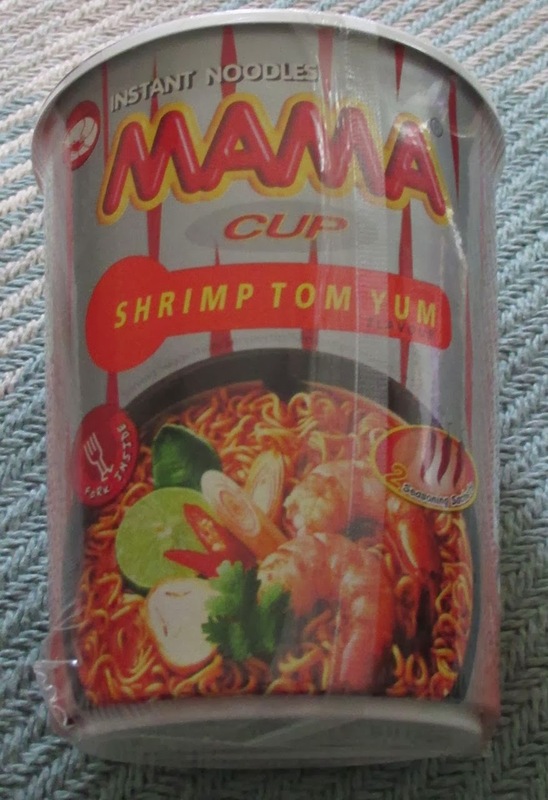 This Mama Cup Shrimp Tom Yum Instant Noodles was produced by Thai President Foods in Bangkok, Thailand. There was a three chilli heat warning on the front of the 70g plastic pot. On peeling back the lid I found two sachets; one of dried Tom Yum sauce mix, and one full of seasoning. There was the ubiquitous plastic fork, of which I dumped in a draw opting for the obligatory metal fork. I added freshly boiled water to the solid mass of stringy noodles, tore open the sachets and dumped in the contents to stir all together. The reddish blended contents of the pot smelt like a fishy Tom Yum soup. Good start! On closer inspection there was stringy noodles, small shredded bits of shrimp, green vegetables though the photographed ingredients was shy on telling me what these were (likely onions) and also a multitude of red chilli flecks. The concoction was left to cool a little while to save my chin from the super heated wet noodles. The instant noodles tasted like a red chilli hot Tom Yum shrimp noodles soup with a hint of citric lime zest at the end of each mouthful. It was a really tasty nose tingling burning chilli heat. The type you're afraid to stop eating in case your head explodes. The stringy noodles soaked up most of the reddish tinted liquid soup. It took a short while to notice my nose was running. All the ingredients had mixed together very well with no bits in the bottom of the pot. I drank off the rest of the red liquid. 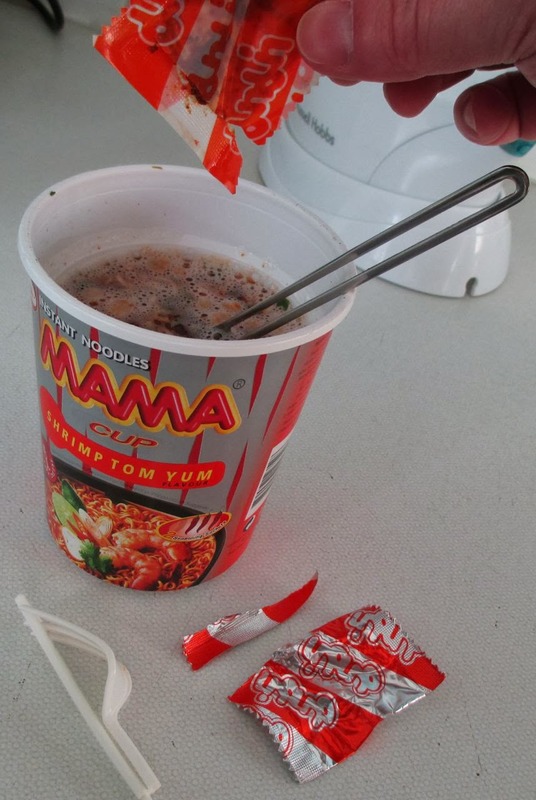 I found this Mama Cup Shrimp Tom Yum Instant Noodles really flavoursome and lip smackingly tasty, it was one of the hottest instant noodles I've tried and was a great alternative to my favourite Nong Shim Hot and Spicy.